Director – Jeff Woolnough, Screenplay – Peter M. Lenkov, Producer – Bob Westheimer, Photography – Russell Goozee, Music – Crunch Recording Group, Ivan Dorochuk, John Kastner & Steve Pecile, Special Effects – Kavanaugh Special Effects (Supervisor – Michael Kavanaugh), Production Design – Jasna Stefanovic. Production Company – Catalyst Entertainment/Unisol Productions/Durrant Fox Productions Inc.
Luc Devreaux and Veronica Roberts travel to an internet conference in Toronto to talk to a former colleague of hers and try to get the Universal Soldier story out to the media. Instead, they stray into a situation where the attendees are taken hostage by terrorists. Luc is able to save the day and despatch the terrorists. They travel back to the US to gather evidence that will expose the Unisol Program. There they are hunted by Universal Soldiers on the orders of Deputy CIA director Gerald Risco, the creator of the Unisol program. They then stumble on to Risco’s plan to use the Universal Soldiers to hijack a shipment of gold being returned to Holocaust victims and set out to stop him. 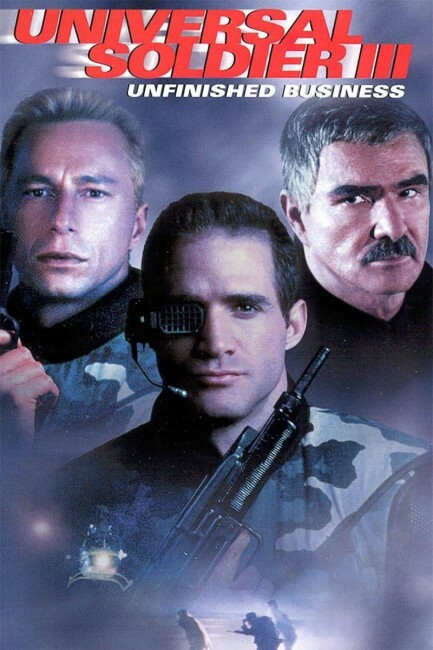 Universal Soldier III: Unfinished Business was the second of two Canadian-made video-released sequels to Roland Emmerich’s Universal Soldier (1992). It was preceded by Universal Soldier II: Brothers in Arms (1998), which was shot back-to-back and shares exactly the same production credits as Unfinished Business. Neither of these are related to the three other sequels featuring Jean-Claude Van Damme and (in the last two) Dolph Lundgren, Universal Soldier: The Return (1999), Universal Soldier: Regeneration (2009) and Universal Soldier: Day of Reckoning (2012). The original Universal Soldier was no more than a brainlessly thudding actioneer. Certainly, as science-fiction, its content was paper-thin. None of the sequels improve on this – indeed, without the budget that the original was made on they are merely cheap action films. Until Regeneration and especially Day of Reckoning, Universal Soldier III: Unfinished Business could be marginally considered the best of the sequels. There is at least the sense that this effort is trying to play around with more concepts than the other sequels, throwing in Unisol sleepers and kids, resurrected terrorists and the like, even if the plot eventually only pans out as a routine variant on Die Hard (1988). Director Jeff Woolnough’s sped-up/slowed-down action seems annoyingly posed and affected. The wooden Matt Battaglia gets numerous Schwarzenegger-esque one-liners – “Thanks for the hand,” or “What do you call that?” “Tae-kwon don’t.” The film has the novelty casting of Burt Reynolds as the sinister CIA director turned heavy. It may say something about how Burt Reynolds’ career slumped from the late 1970s, when he was one of the top box-office stars in the world, to the point he was making hack work like this. Alas, Reynolds is not suited to the sinister heavy thing very well at all.